If you have an Akai sampler with an early operating system installed, you are still running your OS from a floppy or you've just spilled a cup of coffee over your OS disk then this is the page for you. 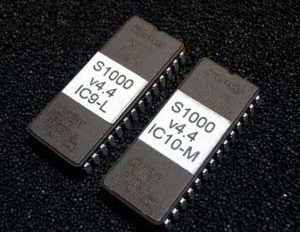 All of these operating system EPROM's can be installed in your sampler in a matter of minutes, so you'll never need a floppy disk ever again. Its as simple as levering the old OS chips out and dropping the new ones in, making sure that the notch in the end of the chips are oriented in the same position as the currently installed ones, You should take the same basic anti-static precautions as you would installing RAM into a computer. 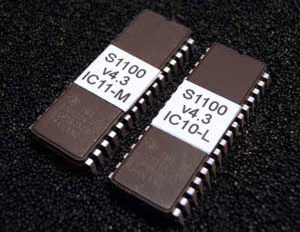 These EPROM's have only ever been stored in antistatic conditions, and will be supplied in a shielded tube..
NOTES: Includes major upgrades in the handling of SCSI drives and SCSI sample transfers, plus the ability to use the MESA sampling editing software and programs like Wavelab or Recycle. There are also several bug fixes. NOTES: The same as the S3000XL but optimised for the S3200XL. 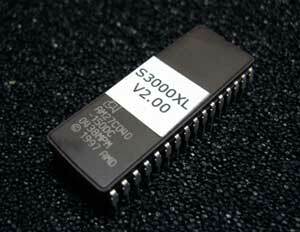 The standard S3000XL EPROM's will not work in the S3200XL. This will not work in a non XL S3200. NOTES: Any operating system above v2.2 included time stretch, and anything over v4.3 includes the ability to load and save from other Akai sampler formats. We're not 100% sure as to exactly what the other upgrades were, but v4.4 was the last operating system released for the S1000. NOTES: Along with the upgrades on the S1000 V4.4 OS above, apparently the S1100 OS v4.3 adds S3000 compatibility and allows 2 track hard disk recording along with other bug fixes. We're not 100% sure as to exactly what the other upgrades were, but v4.3 was the last operating system released for the S1100.